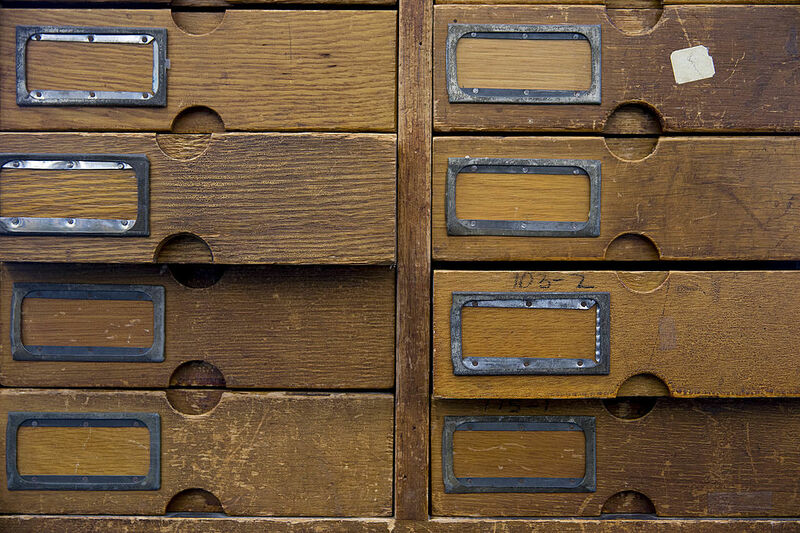 A shoe drawer cabinet inside the U.S. Patent and Trademark Office. Since 2006, hundreds of US businesses have received letters informing them that they infringe patents belonging to Martin Kelly Jones, who briefly ran a business called "BusCall" in the early 90s. The Jones patents, owned for many years by a company called ArrivalStar, have been called out repeatedly as one of the most egregious examples of patent abuse. ArrivalStar sent out hundreds of demand letters, often targeting small companies that couldn't hope to afford a drawn-out defense of a patent infringement suit. It also took the unusual step of suing public transit agencies, saying their bus-tracking systems infringe Jones' patents. The patents were moved into a new entity called Shipping & Transit LLC last year. Jones and the lawyers who work with him have squeezed royalty payments from over 800 companies over the years, but little has been known about him, outside the short explanation included in the demand letters he sends out. Now, Jones has made what appear to be his only public comments since his inventions launched a decade-long campaign of lawsuits, in statements to The Wall Street Journal. “We are one of the pioneers of determining when something is arriving and being able to message that out,” Jones told the newspaper, saying that he spent millions of dollars trying to bring a product to market. Asked why he chooses small businesses as a target, Jones explained that he just doesn't have that many big targets left. “There is no large retailer that is not a licensee,” Jones said. Originally, Jones' patents were aimed at vehicle tracking. But he's held 34 patents over the years—29 of which have expired—and he has a broad view of how they're infringed. Today, he believes any company that sends out an e-mail notification about a shipment owes him money. Even though both FedEx and UPS have paid for the Jones patents, Jones and his lawyers still sue the small companies that use those shippers. While FedEx or UPS's licensed system might cover a shipper, a company would still need to pay for a Jones patent license if it provided additional information, like telling buyers an order is filled, Jones told the Journal. "The second you are using technology beyond what a licensee has, you need a license from us," he said. Jones, a 55-year-old former pro tennis player who has no engineering background, also said his patent litigation doesn't hurt people. He stuck to the tried-and-true line of patent trolls—that his lawsuits actually help innovation. "When inventors can invent and get paid for what they do, I think it promotes invention,” Jones said. The WSJ story on Shipping & Transit has interviews stretching back months, and for those with a close interest in how patent trolls operate, it's worth a read. The newspaper spoke to at least four small businesses targeted by Jones' lawsuits. Those include Wallingford, Ct.-based CD Universe, which sells music, movies, and video games online; its COO Pat Nastri told the newspaper that he was compelled to settle with Shipping & Transit last month. "To fight it would have cost more than settling," Nastri said. Shipping & Transit relies on the expense of patent battles to get settlements before its legal cases finish. Today, the company typically demands between $25,000 and $45,000. Meanwhile, taking a patent case through trial can cost upwards of $1 million. Even new tactics like filing an inter partes review can easily run up legal fees of more than $200,000. As a result, the Jones patents have never been evaluated by a judge. Jones was a minority owner in ArrivalStar, which was formed out of the ruins of BusCall in 2002. In 2015, he joined together with an investor named Peter Sirianni to buy back the patents and form Shipping & Transit. Earlier this year, the Electronic Frontier Foundation sued Shipping & Transit on behalf of another small online retailer, seeking to invalidate the remaining Jones patents. Shipping & Transit lawyers responded by quickly filing papers promising not to sue EFF's client, thus avoiding a judgment on the merits of its patents. Over EFF's objections, a Florida federal judge dismissed (PDF) the case. EFF has appealed that decision. Shipping & Transit patents also face a separate challenge from Unified Patents, a company that seeks to use the inter partes review process to invalidate problematic patents.